This project analyses whether ‘new’ approaches to public sector reform (PSR) centred on leadership, social accountability or policy adaptation are more likely to bypass some of the recurrent shortcomings of conventional ‘Weberian approaches’, which are often blamed for the seeming failure of the PSR agenda over the past two decades. The project compares the evolution of public sector effectiveness (in mandate and in practice) in Ghana, Malawi, Rwanda and Uganda since the turn of the century. 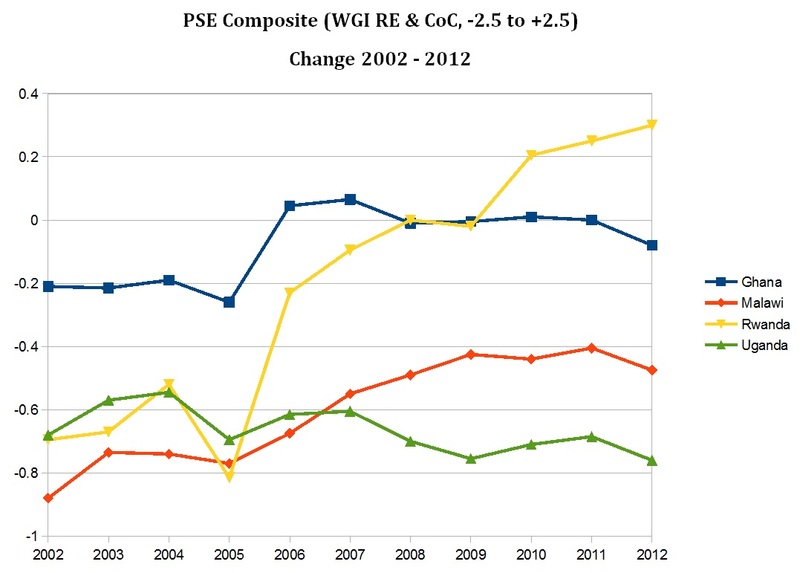 These four countries have been selected for their marked variation in the aggregate trajectory of their public sectors since the early 2000s, as registered, for example, in the Worldwide Governance Indicators: Ghana started from a higher level of effectiveness and yet registered little improvement; Malawi registered some improvement; Rwanda showed remarkable improvement; and Uganda, if anything, showed a slight worsening. The likely explanation for these variable trajectories of public sector reform cannot be reduced to any single, macro-social independent variable: for instance, Rwanda and Uganda are both assumed to have dominant-party political settlements, yet their contrast in PSR could not be starker; similarly, if aid dependence was to be blamed for institutional failure, then Rwanda should have exhibited a more limited improvement. Instead, it is necessary to delve deeper into the causal processes linking explanation and outcome within and across five public sector nodes or core country systems: public sector planning; public/civil service management; public finance management; oversight; and anti-corruption. How do different approaches to PSR (leadership, social accountability, policy adaptation, Weberian administration) impact the effectiveness of core public sector nodes? How do different approaches interact with each other? Do different approaches to PSR promote competence and integrity to the same extent? How do external and internal factors interact for each approach to public sector reform? How does the type of political settlement interact with each approach to public sector reform? Within-country comparisons: A focus on each country allows us to explore how different approaches have been used in the same local context. This strategy illustrates the analytical contrasts between PSR approaches. Cross-country comparisons: A focus on each PSR node allows us to explore how different local contexts influence functionally equivalent instances of reform. This strategy illustrates the analytical contrasts between political settlements. The analytical narratives for each country are based for the most part on primary sources, both documentation (public and internal) and semi-structured interviews, from core public organisations as well as non-governmental and donor organisations in each country. This project is explicitly aligned with some of the central ESID goals, such as identifying the determinants of state effectiveness, exploring the underlying sources of elite commitment, linking material and ideational factors, as well as bridging the internal-external divide. Badru Bukenya (2017). ‘Are service‐delivery NGOs building state capacity in the Global South? Experiences from HIV/AIDS programmes in rural Uganda‘. Development Policy Review 36(S1): 0378-0399. Abdul-Gafaru Abdulai (2019). ‘Rethinking elite commitment to social protection in Ghana: Insights from an adapted political settlements approach‘. ESID Working Paper No. 112. Pablo Yanguas (2017). ”Varieties of state-building in Africa: Elites, ideas and the politics of public sector reform‘. ESID Working Paper No. 89. Benamin Chemouni (2017). ‘The politics of core public sector reform in Rwanda‘. ESID Working Paper No. 88. Badru Bukenya and William Muhumuza (2017). ‘The politics of core sector public reform in Uganda: Behind the façade‘. ESID Working Paper 85. Daniel Appiah and Abdul-Gafaru Abdulai (2017). ‘Competitive clientelism and the politics of core public sector reform in Ghana‘. ESID Working Paper 82. Badru Bukenya and Pablo Yanguas (2013). ‘Building state capacity for inclusive development: The politics of public sector reform‘. ESID Working Paper 25. Badru Bukenya (2013). ‘Are service-delivery NGOs building state capacity in the global South? Experiences from HIV/AIDS programmes in rural Uganda‘. ESID Working Paper 22. Closing the gap between form and function: A new approach to institutional reform in Uganda. ESID Briefing Paper 2. Henry Chingaipe, 15 January 2015: ‘Researching the politics of public sector reforms in Malawi‘. Badru Bukenya, 2 March 2015: ‘Undertaking PSR research in Uganda‘. Pablo Yanguas, 31 March 2014: Designing ESID’s research on public sector reform.